Ease and comfort are at the forefront of interior design on a vehicle, and with the Ford C-MAX, you'll get the features that will make the ride more enjoyable and loading easier than ever. This popular compact hybrid can keep you cool on hot days and warm when it's cold outside. It also has features that will allow you to open doors without even putting your parcels on the ground. The heated front seats mean that you will never have to sit on a cold seat for long. And with the dual-zone climate control feature, you'll never have to sacrifice your comfort for your passengers preferences. If you want to make loading your vehicle easier, just use the hands-free, foot-activated liftgate. With the fob in your pocket, you'll never have to put your groceries on the ground to open the door again. 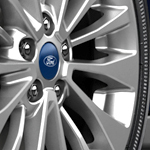 If you're interested in learning more, come to Hempstead Ford Lincoln for a test drive.